After two weeks road-tripping through national parks and country towns across the southwest, it was time to balance out all that fresh air and exercise with a bit of city living. Cocktails, dinner, shopping and art were all on the agenda, and where better to get my fill of them than the ‘city different’ – Santa Fe. 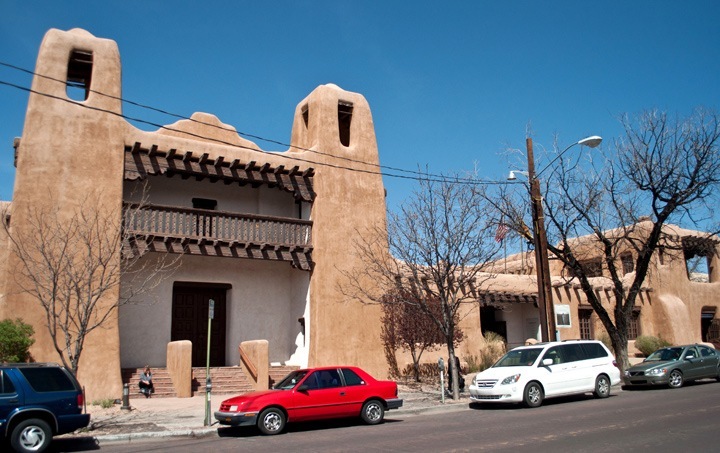 In the shadow of the Sangre de Cristo Mountains, the city is one of the oldest in the USA, with a distinctive southwestern look developed from a mixture of Native American, Spanish and Mexican residents over the years. 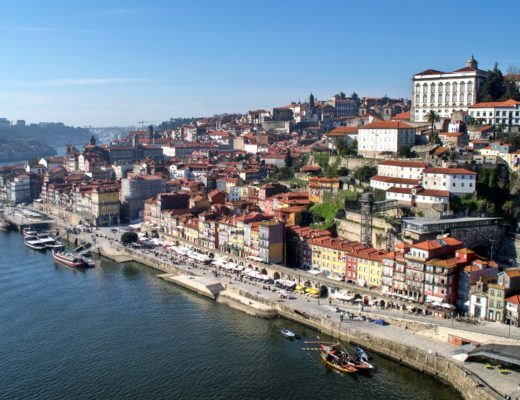 Add in a huge creative and artistic community and a great food and drink scene and you have a laid-back city that warrants a few days’ exploration. 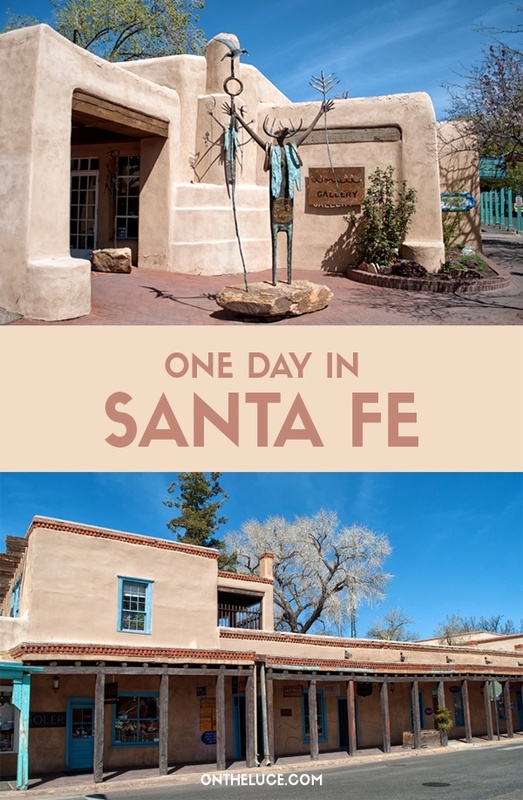 But with only one to spare before we headed onwards towards our flight home, it was time to see what you can do with one day in Santa Fe. 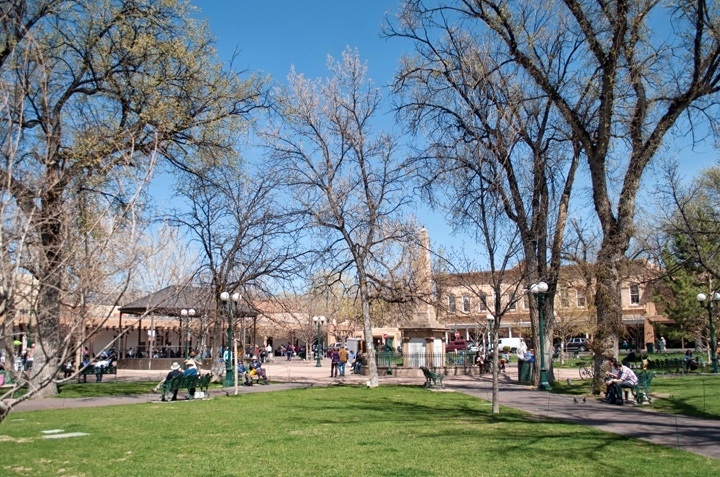 Santa Fe’s street radiate from the central plaza, where every bench was taken with people relaxing on a sunny afternoon. The plaza is a national historic landmark and is surrounded by galleries, museums, shops and restaurants. It’s an easy city to get around by foot, with lots of interesting-looking side streets to get diverted off down. The city has a really different architecture style from the other places we’d visited, with its terracotta-colored adobe buildings, made of a mixture of sun-dried earth and straw. It’s not all adobe in Santa Fe though, there are some buildings which look more like they’ve been transported in from Europe. 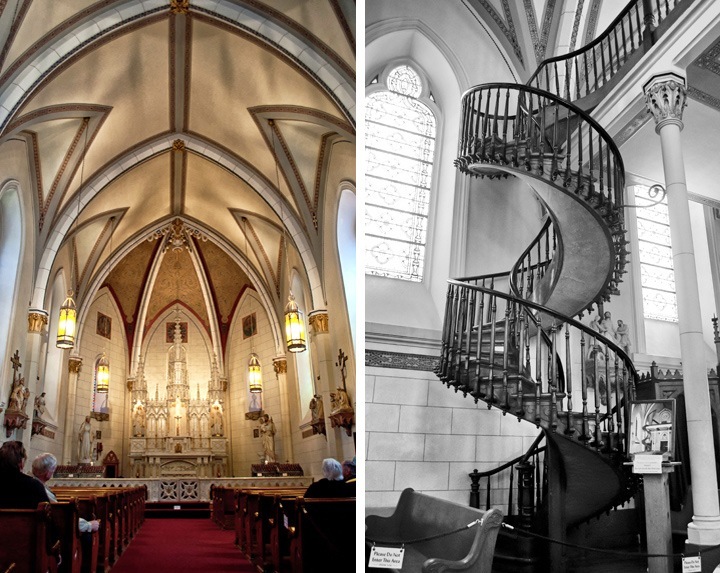 One of the most interesting was the Gothic-style Loretto Chapel. Apparently inspired by Sainte-Chapelle in Paris, it was built in 1878 and is famous for it’s ‘miraculous staircase’. The story goes that when it was being built none of the local stonemasons knew how to build a spiral staircase. So the nuns prayed for help and St Joseph – in the guise of a mysterious travelling carpenter – arrived and built them one that’s still there today. There are no visible supports so it’s a mystery how it stays up. The chapel’s now a museum so you can go and see it to try and work it out for yourself. Being surrounded by mountains and with its high-altitude clear light, Santa Fe has a long tradition of attracting artists. 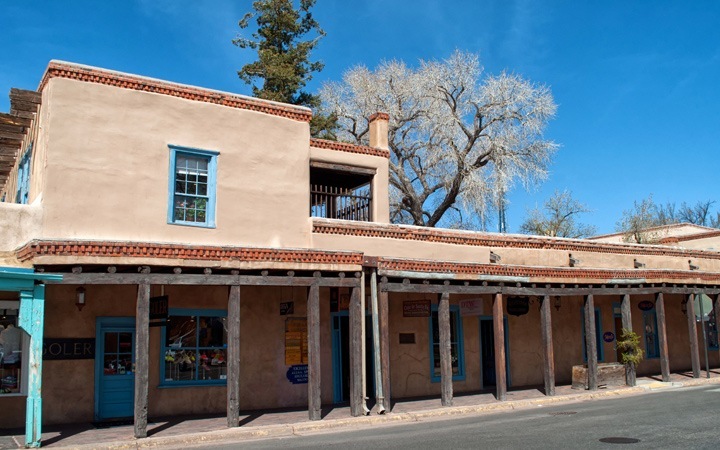 The city has several museums, the most famous being the one dedicated to the painter Georgia O’Keefe who lived and painted in New Mexico. As well as the museums there’s the half-mile long Canyon Road where you can check out over 100 art galleries and studios. There are artworks dotted all around the city, so we came across mosaics, sculptures and murals as we wandered. 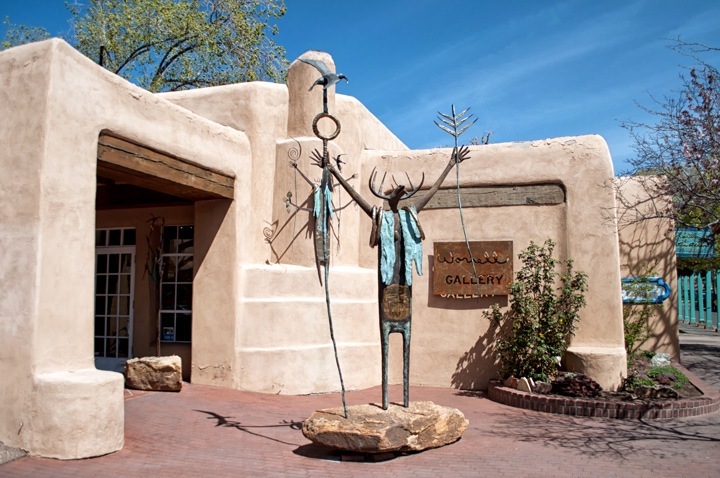 As well as art, Santa Fe’s also known for its silver and turquoise Native American jewellery – with local artists selling their work in a line outside the Palace of the Governors – and leather goods, blankets and rugs. Heading away from the plaza, we also took a walk around the city’s redeveloped railyard district. This part of the city had fallen into disrepair after the train route through town stopped running. But instead of knocking down the old warehouses they’ve been converted into galleries, art and craft stores and restaurants. 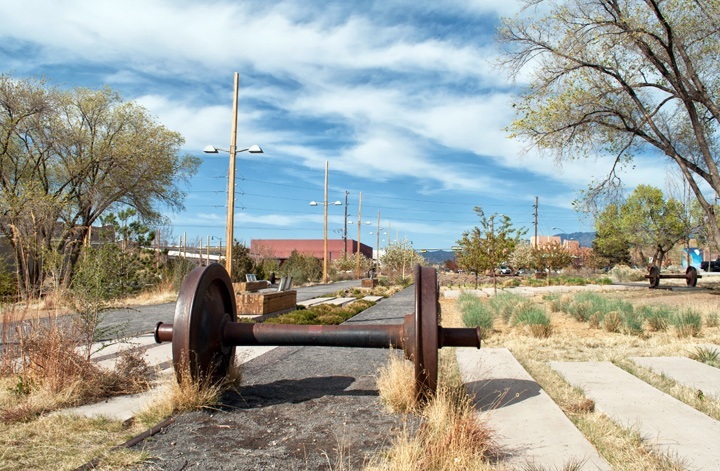 There’s a huge farmers’ market as well as a park which cleverly incorporates reminders of its past life with old railway tracks and train wheels mixed in with native plants and trees. But enough walking, it was time for that well-deserved drink – though at 7000 feet above sea level you might feel it a bit more than you would normally. We headed up higher still to the Marble Bewery Tap Room on a terrace overlooking the plaza. 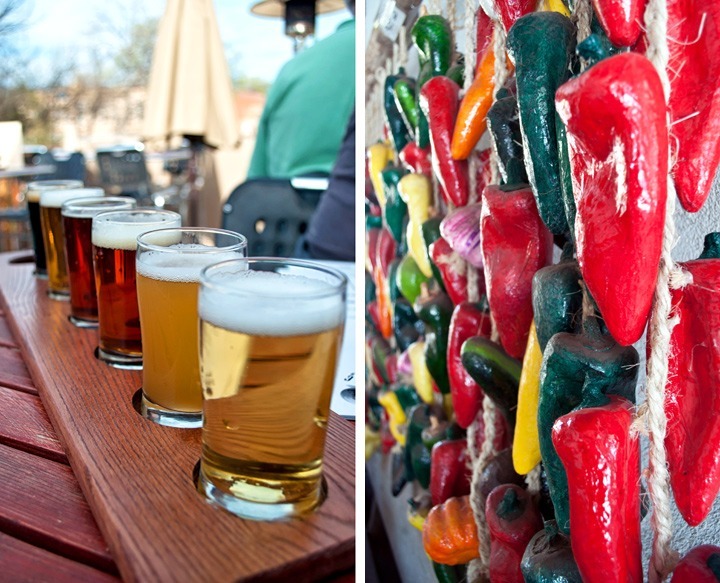 This New Mexican microbrewery do a tasting board where you can sample six of their most popular beers, which we soaked up with pizzas from the neighbouring Rooftop Pizzeria. The blue corn base added a Santa Fe-style twist to the pizza and the chilli added the kick. You can’t get away from chilli peppers in New Mexico – they’re the state’s official vegetable and you can choose whether you’d like yours red, green or ‘Christmas’ (a mixture of both). One day definitely wasn’t enough time to properly experience Santa Fe – we didn’t see all the museums, make it to the opera or try out a spa, let alone getting out into the mountains and countryside beyond. But it was just enough to get a taste of the city and a different kind of southwest lifestyle. We did manage to pack in quite a lot into that one day! I loved the colours of the city and took a lot of shots in the time we were there. Strange isn’t it – even close up we couldn’t see how it manages to stay up. One of America’s best cities. Even in my short visit I really liked it – great combination of things to do and being small enough not to be too overwhelming. I spent one day in Santa Fe a few years ago and loved it. I must get back and spend more time. Great pictures. Thanks Darlene, I would’ve happily spent a few more days there but enjoyed the city even for that short visit. I love Santa Fe and am lucky enough to have visited many times; my parents have a house there. It’s a long trek from home for me and my boys though, so I haven’t been back for a couple of years, but your photos make me long for the creative energy I always feel when I’m there. Great food, beautiful architecture and fantastic art & jewelry. It does have such a great creative and artistic energy and feel to it – must be great to have a base there where you can go and stay too. 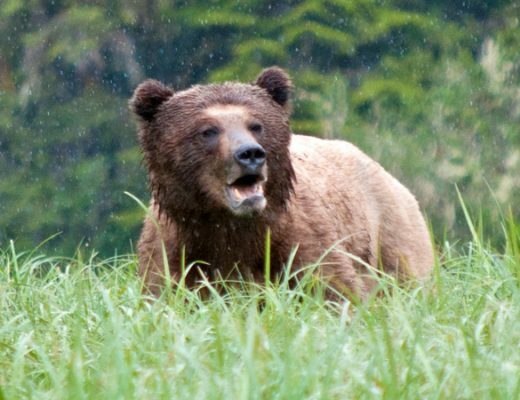 Wonderful blog, Lucy! Glad you enjoyed your visit. 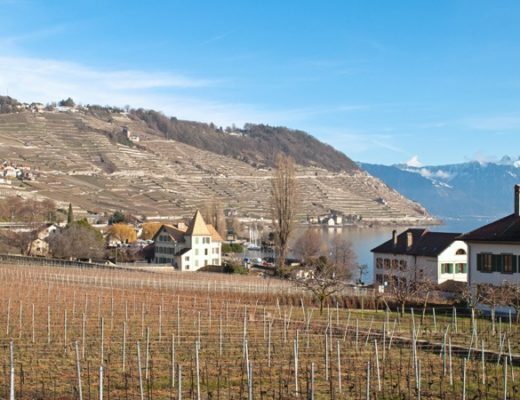 You definitely need to visit again for a longer period so you can truly experience our art, culture, cuisine, and pristine nature! Thanks so much! I had a really great time, only a shame that we didn’t have longer to spend but it’s high on the list for a return visit with more time for a proper exploration. Lucy, we spent a few days in Santa Fe last summer and really enjoyed it. From strolling a few of the art galleries to savoring a bit of southwestern food (something we’d missed having been in Germany so long) it was a great trip. How long was your road-trip in all? It’s such a great place to just wander around and see what you come across. My road trip was two weeks and Santa Fe was near the end, after the National Parks in Utah and a couple of days in Colorado, then before heading over to Sedona and home from Phoenix. Had a really great trip and already planning another US trip next year. Do you recall where you stayed at?